Keep up with all the latest Apple and iPhone news at TNW Apple. Every time a new iPhone gets released, everyone rushes to check to see if they are eligible for upgrade to Apple’s newest device. 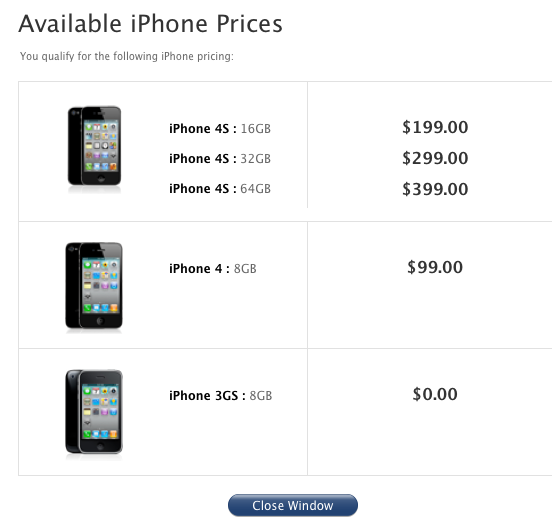 Today’s announcement of the iPhone 4S has been no different and just minutes after the eligibility checker went live on Apple’s site, we were already seeing indications that not everyone was going to be happy about the results. Updates below. What it looks like at this point is that many who purchased the iPhone 4 on June 24th, 2010, its launch day on AT&T, will not be eligible for upgrade. Well, this stands to reason—you may be thinking at this point—as AT&T’s normal upgrade cycle is 18 months for early upgrade and 24 months for contractual renewal upgrade. But it’s not that simple. We noticed, as did many we polled on Twitter, that the upgrade dates were varying for people, even if they had both purchased the iPhone on that same date last year. I, for instance, am eligible for an upgrade according to Apple’s upgrade checker, which you can find here. A friend of mine is not, even though he was right behind me in the local Apple Store line. This would seem to kill the ‘early upgrade 18 month’ theory, as it has only been a little over 13 months since I purchased my iPhone. Your billing history – If you have defaulted on your account or been late in payments, then this could lengthen the ‘early upgrade’ wait period for you. If, on the other hand, you were a loyal paying customer who has a history of paying when due, that could shorten the period. The length of your contract – Yes, how long you’ve been on contract is still a factor in this. If you’ve only been on contract 6 months, it is unlikely that you will see an upgrade plan. A “variety of other factors” – They would not specify what these were. The one thing that I could not get them to say outright is that your plan, that is, how much you pay for service on AT&T, was one of the factors that AT&T considered when calculating your eligibility. Honestly, it would make a lot of sense to me if it was, as this is how the carriers recoup their costs in subsidizing devices for you, but once again, we could not get them to confirm that this was a factor. So, in the end, the answer is really, “it depends” and the factors are up to AT&T to know fully. We have seen several examples of people, all having purchased their devices on ‘opening day’, that have been eligible now, November 25th and February 29th, respectively. This seems like a wide spread representing a very early upgrade, a minor shortening of the upgrade window and the standard ’18-month’ early upgrade cycle. While we talked to AT&T specifically, it is likely that most major carriers factor their upgrades in a very similar manner. If you’re interested in seeing whether you are or are not eligible, you can visit the AT&T Wireless website here and log in to check your status, or visit Apple’s tool here and enter your AT&T account info. AT&T will also have an AT&T Upgrade App available on the App Store later today from which you can check availability and pre-order your iPhone 4S. Update: We’ve been getting numerous emails and comments about this article and some of them have been very interesting. It seems that several of our readers were told explicitly by AT&T on the phone or in writing that it does matter how much money you spend on your plan. This fits in with my speculation and would make a lot of sense monetarily for AT&T. The representative we spoke to was unable to get confirmation of this for us even though she spoke to a higher-up at the company. But the many examples that we’re seeing appear to indicate that yes, if you spend more on your plan, you will get to upgrade faster. This rules appear to apply differently to the lead device on a group or corporate plan as well, something we were tipped to when we began researching this topic. Last year, when the iPhone 4 was released, I called AT&T to find out which of our corporate phones were eligible for an upgrade. Other phones aside, out of 12 iPhones that were purchased simultaneously, one was eligible. The one that is considered the “main” phone and carries the corporate plan; the rest would have had to wait six more months to hit the 18-month mark. When I asked (somewhat stunned) why that phone was eligible, they said it was because of the billed dollar volume on that line. So there ya go. I’m not an AT&T rep, but one did at least tell me point-blank that how much you spend with AT&T is a major factor. “Tier 1 customers,” aka those who spend the most money per month (unlimited minutes + 2gb data + unlimited texts) are eligible every 12 months for early upgrade. “Tier 2 customers,” aka [almost every subscriber,] who have either the 900 or the 450 minute plan but who still use the highest data plan and highest texting plan are eligible every 18 months. “Tier 3 customers,” the ones who spend as little as possible and or the ones who’ve had late pays or service interruptions must wait the full 24.